The German Government considers investing in completion of the Podilsko-Voskresinsky bridge crossing, the construction of which begun in 1993, head of transport infrastructure department of the Kyiv State City Administration Serhiy Maisel wrote on Facebook July 11, citing State Secretary of the Ministry of transport and Digital Infrastructure of Germany Rainer Bomba as saying during the inspection of the bridge. A working group is to be set up in September, consisting of experts from both sides. A working meeting will be held in Kyiv or Berlin with the German minister of infrastructure as early as October, according to Maisel. Read alsoKyiv authorities seeking to host Eurovision-2017He added that German funding may ensure completion of the bridge in four years, as well as the construction of Podilsko-Vyhurivska line of the Kyiv Subway to Troyeshchyna residential district. 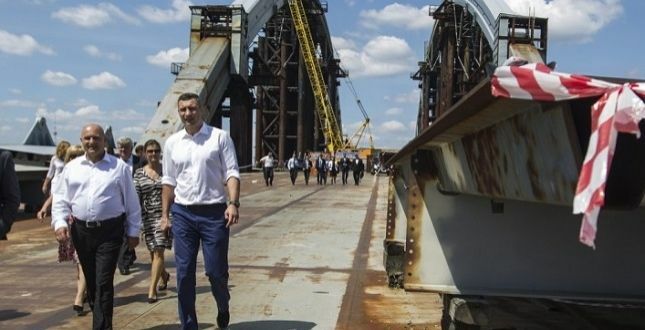 Kyiv Mayor Vitali Klitschko, who inspected the bridge together with a delegation of German experts and entrepreneurs led by Mr Bomba, has said that the bridge is half-ready but its completion needs funding the city budget can’t afford, the press service of the KSCA reported.